Team members unloading one of the three MK82 bombs at RENEW’s demolition site in Trieu Trach Commune, Trieu Phong District for disposal. RENEW teams on Tuesday removed three 500-pound US-made aerial bombs from Gio Linh District Police headquarters after responding to the emergency call from police officers. Escorted by a police convoy, the teams safely transported the three unexploded bombs to RENEW’s demolition site for disposal. Early Monday morning, suspicious that a truck might be illegally transporting explosives, police stopped the vehicle and discovered three big bombs lying in the covered cargo bed. 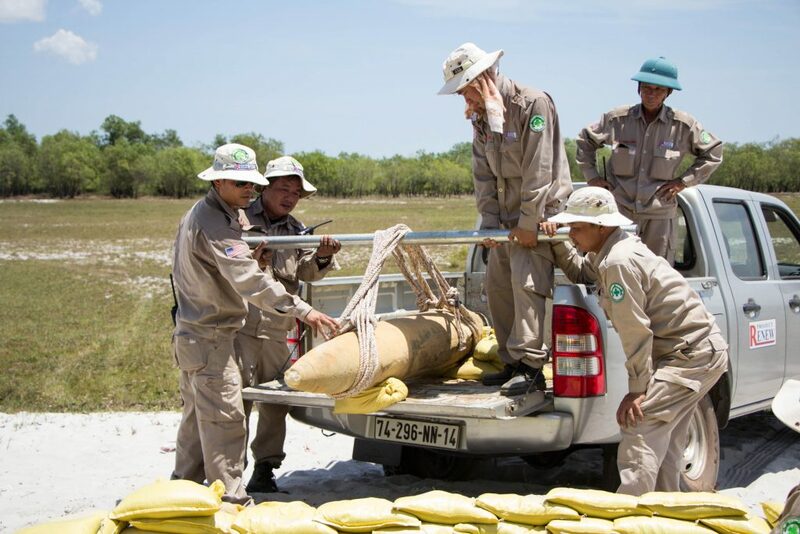 According to Major Nguyen Van Binh, Head of the Investigation Unit of the Gio Linh District Police, metal collectors from Ha Loi Trung Village of Trung Giang Commune had dug out the three bombs from a sand dune near Gio Linh beach, which they sold to a scrap metal dealer. The dealer was transporting the dangerous weapons out of the village to resell them when he was caught in the act of transporting explosives, which is banned under Vietnam law. 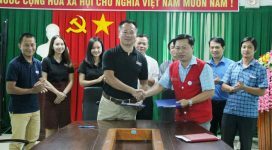 The police reported the emergency to the Provincial Military Commander, who then contacted Project RENEW and requested technical help. Tuesday morning, members of EOD Team No. 1 arrived at the police headquarters, with RENEW’s National Technical Officer Bui Trong Hong. Having identified the ordnance as MK82 500-pound bombs, which were safe to remove, Mr. Hong directed the team in transporting the bombs to RENEW’s demolition site for destruction. The three bombs were safely destroyed today at RENEW’s demolition site in Linh An Village of Trieu Trach Commune, Trieu Phong District. It took the teams half a day to prepare for demolition. 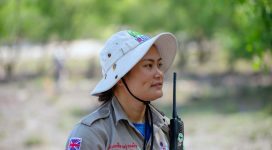 Scrap metal scavenging remains one of the leading causes of death and injury from unexploded ordnance (UXO) in Quang Tri Province. A small number of local people still defy the risks, however, collecting war scrap because of economic pressure. 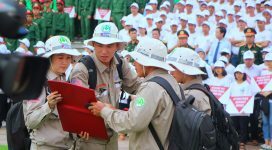 In 2015, three men were killed in two UXO accidents while they were attempting to dismantle munitions to sell for scrap.